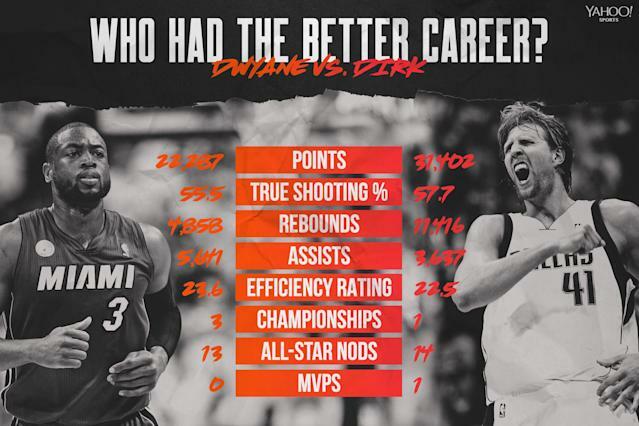 Dwyane Wade vs. Dirk Nowitzki: Whose NBA career was better? Victors are determined decisively on the court, but one of the great fundamental joys of fandom outside the lines has no clear winner. We love to weigh the merits of our favorite competitors’ accomplishments against each other, and yet a taproom full of basketball fans will never yield a unanimous decision on the G.O.A.T. In this series, we attempt to settle scores of NBA undercard debates — or at least give you fodder for your next “Who was better?” argument. Wade’s prime began in his breakout sophomore campaign and lasted 11 seasons, culminating in a failed bid for the playoffs in Miami’s first season post-LeBron James. From 2004-15, he averaged 24.8 points (49.2 FG%, 28.8 3P%, 76.6 FT%), six assists, five rebounds and 2.6 combined blocks/steals, making 10 playoff appearances and earning eight top-10 MVP finishes. He was his team’s best player in six of those 11 seasons, ceding status to Shaquille O’Neal during his 2004-05 MVP runner-up campaign and LeBron James in their four seasons together. Nowitzki entered his prime in Year Three and remained in that stratosphere for 12 seasons, leading the Mavericks to the playoffs each year. From 2000-12, he averaged 24.1 points (47.8 FG%, 38.4 3P%, 88.3 FT%), 8.7 rebounds, 2.7 assists and 1.9 blocks/steals per game. He was the best player on his team every year, finishing top-10 in MVP voting nine times in that stretch and winning the award in the 2006-07 season (he placed 11th and 12th the other two years). His best years were bookended by four-year stretches with a pre-MVP Steve Nash and post-prime Jason Kidd, with Jason Terry and Michael Finley serving as his best teammates in between. Nowitzki remained remarkably healthy during his prime, never missing more than nine games in a single season. Save for the lockout-shortened 2011-12 campaign, the Mavericks won 50 or more games each year, including three 60-win seasons in the consistently superior Western Conference. Wade, meanwhile, missed 15 or more games five times during his prime. His three All-Defensive nods give him an edge on that end, but the Heat’s 15-win 2007-08 season in the watered-down East is an impossible-to-ignore black mark when comparing their overall impact. Nowitzki’s health and longevity have him seventh on the all-time scoring list, on the verge of surpassing Wilt Chamberlain for sixth. Wade is 30th, about to be eclipsed by Kevin Durant. Nowitzki is also a top-30 rebounder in NBA history. Wade is top 50 in both steals and assists. Wade’s 30.2 points per game led the league in 2008-09, when he finished third behind James and Kobe Bryant for his best MVP finish, but his Heat were 43-39 that year and lost in the first round. His apex is 2005-06, his third NBA season, when he averaged 27.2 points, 6.7 assists, 5.7 rebounds and 1.9 steals per game on 57.7 percent true shooting before elevating his game in the playoffs and capturing Finals MVP honors for a 52-win team that featured O’Neal in his early decline. Wade was a Second-Team All-NBA guard behind Bryant and Nash that year. Nowitzki finished higher in the MVP voting during Wade’s 2005-06 season, when he had his second of three straight top-three finishes. His regular-season apex came the following year, when he won the league’s top honor upon averaging 24.6 points, 8.9 rebounds and 3.4 assists on 60.5 percent true shooting for a Mavs team that won 67 games and shockingly lost as a No. 1 seed in the first round. His playoff apex came four years later, when he averaged 28 and eight on better than 60 percent shooting, securing 2011 Finals MVP honors en route to his lone title. He was a Second-Team All-NBA forward behind James and Kevin Durant that season. It is remarkable that their playoff apexes came opposite each other. Wade earned the nickname Flash for his downhill play in 2006, when his athleticism allowed him to get wherever he wanted and score through contact at a wild rate — a little too wild, if you ask Dallas personnel and NBA conspiracy theorists. Yet, there is no denying Wade’s Finals performance. He outplayed an inefficient Nowitzki in the series, averaging 34.7 points, 7.8 boards, 3.8 assists, 2.7 steals and a block, including a 36-10-5-4-3 line in the decisive Game 6. Nowitzki’s craftiness won the day in 2011, when he averaged 26 points, 9.7 rebounds and two assists per game in the Finals. Except, it was James who cratered in the series and opened the door for the underdog Mavs. Wade was arguably Nowitzki’s statistical equal in the six-game set, averaging 26.5 points (on 54.6 percent shooting), seven rebounds, 5.2 assists and three combined blocks/steals. Neither Nowitzki nor Wade was all that special in the deciding game. In their two Finals meetings, Wade averaged 30.6 points (50.2 FG%, 29.4 3P%, 74.7 FT%), 7.4 rebounds, 4.5 assists, 2.1 steals and 1.3 blocks per game to Nowitzki’s 24.4 points (40.4 FG%, 30.2 3P%, 93.1 FT%), 10.3 rebounds, 2.3 assists and 1.3 combined blocks/steals per game. Nowitzki owns a 13-14 record in 27 playoff series, including the one title, two Finals, three conference finals and eight first-round exits. The 2007 first-round loss to the eighth-seeded Golden State Warriors, in which Nowitzki shot 38.3 percent from the field, was his darkest postseason hour, but his playoff road is lined with losses to Western Conference powerhouses. Wade’s teams won 22 of their 32 playoff series, including three titles, five Finals, six conference finals and five first-round exits. Granted, he often had more help in a worse conference, but Wade only lost a playoff series as the favorite twice — a seven-game East finals lost to the eventual champion Detroit Pistons in his rookie season and the 2011 Finals loss to the Mavs. • Wade: Three-time champion (2006 Finals MVP); 13-time All-Star; eight-time All-NBA selection (2x First Team, 3x Second Team, 3x Third Team); three-time Second Team All-Defense; 2009 scoring champion; 2010 All-Star Game MVP; Olympic gold (2008) and bronze (2004) medalist. • Nowitzki: 2007 NBA MVP; 2011 champion (Finals MVP); 14-time All-Star; 12-time All-NBA selection (4x First Team, 5x Second Team, 3x Third Team); 50-40-90 club (2007); 2006 Three-Point Shootout champion; 2002 FIBA World Cup MVP; 2005 FIBA EuroBasket MVP. The edge goes to Nowitzki, mostly for the MVP trophy on his mantle, but also for ranking among the league’s 10 best players in four more seasons than Wade — almost a quarter of his career. Considering Wade won his rings with Shaq and LeBron, you could also argue that Nowitzki’s ring holds more value on its own, especially considering it came against a Heat team assembled to wipe the floor with the rest of the league. But that’s probably discounting Wade’s 2006 run. Likewise, we should make note of Wade’s contributions to the Redeem Team, since USA Basketball assistant Jim Boeheim told us this past summer, “He might’ve been our best player” — on a roster with LeBron and Kobe in their primes. Still, it’s hard to measure his gold medal on a loaded Team USA against Nowitzki’s two decades of service to the German national team. As Heat coach Erik Spoelstra once said of Wade’s impact in Miami, “Down here, he’s as impactful as the mayor.” His contributions to South Florida go well beyond the basketball court, and that was apparent in his supportive role in response to the Parkland shooting last year. As far as impact on the game goes, Wade is unquestionably one of the five greatest two guards in NBA history and might rank as high as third on the list behind Michael Jordan and Kobe, depending on where you have Jerry West and how high James Harden climbs in the coming years. Aside from the faulty math, the “fall seven times, stand up eight” Nike commercial that ran in the early portion of his career best captured Wade — a fearless and relentless competitor. Yet, as his farewell tour makes its final stops, Wade will probably be best remembered outside Miami as the man who ceded his alpha status to LeBron on a superteam that altered the NBA landscape forever, fair or not. For better or worse, his recruitment of James and Chris Bosh changed the way teams are built, and his partnership with James will endure above all else. Nowitzki, meanwhile, is equally beloved in Dallas, where he spent his entire career pursuing greatness as rosters were more traditionally constructed, torn down and rebuilt around him. 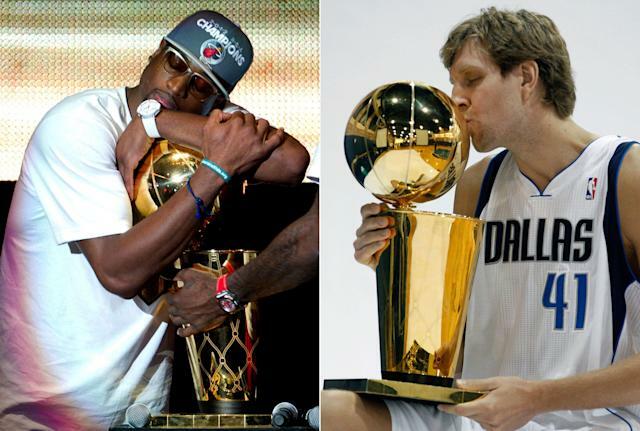 Like Wade, Nowitzki is one of the five best players ever to field his position. You could argue him all the way up to second behind Tim Duncan, but Karl Malone, Kevin Garnett and Charles Barkley might all beg to differ. Nowitzki is, more plainly, the best-shooting big man the game has ever produced — an evolution that birthed the stretch-big movement — and his one-legged fadeaway is among the most unstoppable moves in NBA history. Its timelessness over two decades is one of the few things that could outlast Wade’s endless pursuit of the rim. While Nowitzki has yet to concede that this is his final season, everyone around him is acting as if it is. Regardless, his 21 seasons on the Mavericks are already the most by anyone on a single team, which would be a fine legacy on its own, but there is also this: Nowitzki is undoubtedly the greatest European player in history and arguably the best foreign-born player ever. (Hakeem Olajuwon might have something to say about that). Nowitzki’s career has changed the way the NBA evaluates Euros and served as an inspiration to a generation of imports, from Giannis Antetokounmpo to Luka Doncic. The game is more global than ever in part because of him. THE DAGGER: Dirk Nowitzki was better. If you have an idea for a matchup you would like to see in this series, let us know.